Out of pure coincidence I seem to have spent a fair amount of my time recently frequenting various venues of the Drake and Morgan chain. There's The Refinery, The Folly and now The Happenstance amongst six other sites. 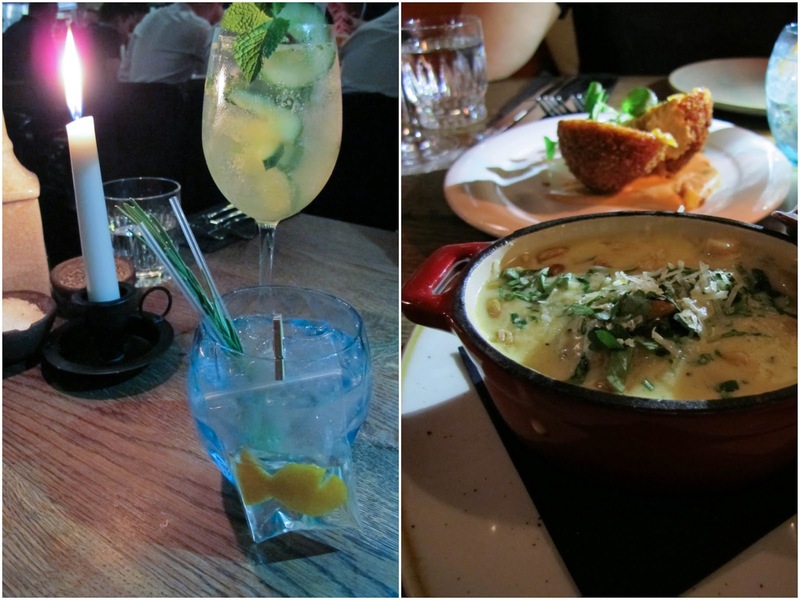 Last week I was invited to sample The Happenstance's new Autumn menu which at the time felt premature on the hottest day in September since time began. But now I'm fully in the swing of things, pumpkins, coats, scarves 'n all (you'll be happy to hear!). On first glimpses we were a little concerned about whether our table was to be near the busy bar area. Something all to familiar from dining at The Folly. Fortunately we were soon ushered up to the dining room and handed a glass of fizz and the menu. Next up for Flick and I on our culinary quest was the drinks list. I've fond memories of sitting in a deck chair watching Wimbledon and drinking a goldfish in a bag cocktail at The Refinery. So you guessed it, when I clocked it on the menu this is exactly what I ordered. Now I know this sounds very unladylike of me, but its not the goldfish bowl of our student years. Its a bit of fun, ultimately a supercharged G&T with the addition of vodka and rosemary, and I love it. First up on the menu was chorizo and paprika scotch egg followed by meatballs with cannellini beans, feta and pine nuts. I couldn't quite find the feta flavour in the meatballs which would have added to the kick of seasoning that they needed. We were also thrown by them being in a creamy sauce rather than your regular tomato. Not necessarily a bad thing, just needed a little lift. The scotch egg, however, was sublime and I'd happily eat plenty more. 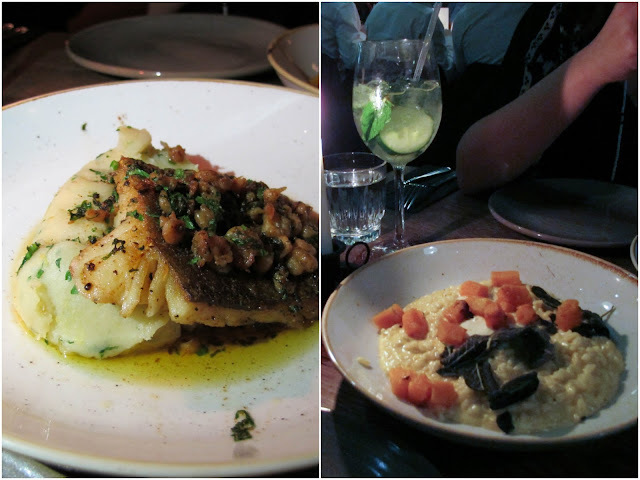 Next up for mains, we shared a butternut squash risotto and roast cod with brown shrimp and mash. Sadly the risotto was not quite to my taste as I'd expected the squash to be a primary ingredient rather than a few cubes on the top. The brown shrimp and cod were pretty good, despite lots of surplus oil on the dish, but I'd have loved a sauce to accompany it. 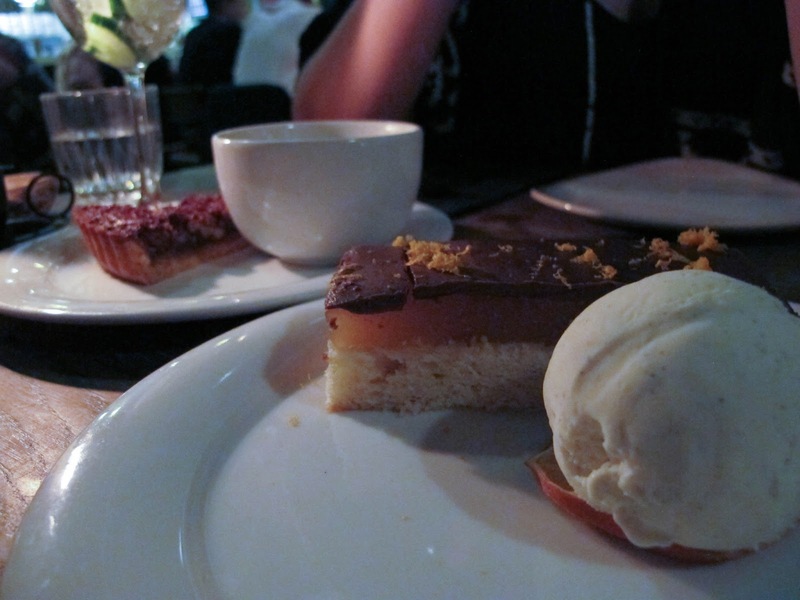 For dessert, the pecan tart came up absolute trumps. So much so its inspired Flick to invite the gang round for Sunday dinner this week and pecan tart is on the menu! And still obsessed by Jaffa Cakes from week 1 of the Great British Bake Off, I also opted for their chocolate orange jaffa cake for dessert. A soft genoise slice, layered with orange jelly and chocolate. Send me more please! Overall, the venue is great and ideally located. The separate dining area is great too. I'd recommend it most especially for their creative cocktails, and if you're looking for those after work/food drinks. 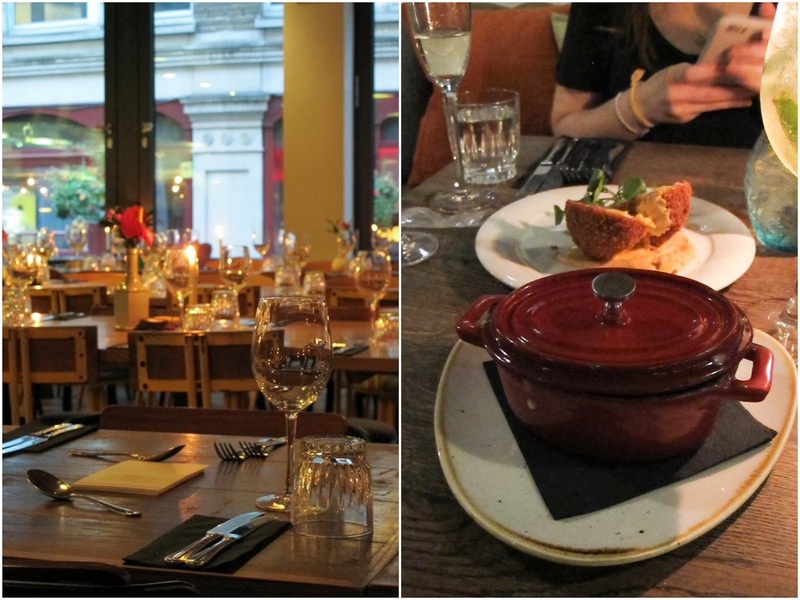 Find The Happenstance nearest to St. Paul's station and check out their menu here.